If the bloggers sound familiar, that’s because we baked a boatload of cookies together back in December. This time around we had six breads to choose from, one per week during February. We’re tying this in with BYOB, aka Bake Your Own Bread, hosted by Sandy. Visit her blog for more information on how that event works. I chose these cracked wheat knot rolls first because they have some whole wheat flour, plus I like the crunch of cracked wheat and the shape of the rolls. 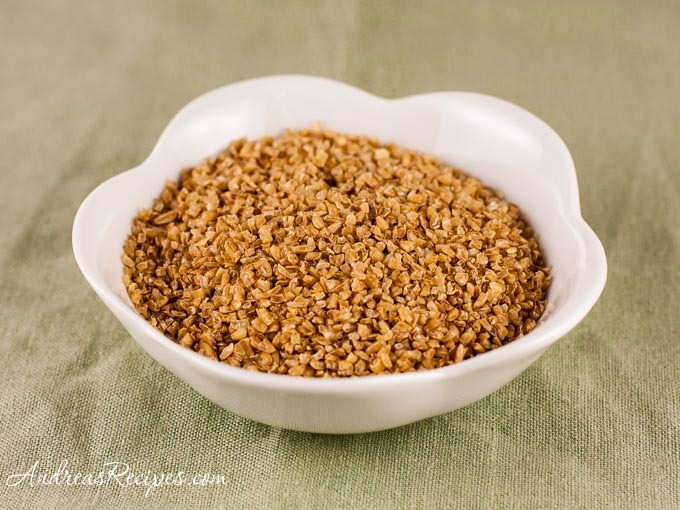 Cracked wheat, similar to bulgur, is a crushed wheat grain that has not been parboiled. It’s not always easy to find and might even be labeled as bulgur because experts do not necessarily agree on the difference, so check any local Indian or Middle Eastern markets for it. If you can’t find it, bulgur makes a fine substitute. The rolls were a hit. Great flavor plus chewy texture combined with the salty top gives these a whole grain pretzel aura. Top Gun couldn’t leave them alone while waiting for dinner and I had to lay down a strict rule that none of the boys got a roll until they had eaten at least one bowl of their soup, otherwise the homemade chicken soup they normally like would have gone untouched while they devoured the rolls. I work exclusively with instant yeast and modified the instructions for that type, and I included the instructions for active dry yeast in parentheses. The rolls require one hour beginning prep, about three to four hours of total rising time, about 20 minutes for rolling and shaping, and 20 to 25 minutes for baking, so plan ahead if you want these for dinner. Stay tuned for more BYOB and delicious breads from our baking group. In the small bowl, stir together boiling-hot water, cracked wheat or bulgur, and 1/2 teaspoon salt, then let stand until the grains are tender, about 40 minutes. While grains soak, heat milk with butter in the small saucepan over low heat just until butter is melted. Add the warm water and honey to the hot milk mixture. Drain bulgur in a sieve, then mix bulgur and milk mixture into flour mixture with the hook attachment on low speed (or a wooden spoon or rubber spatula if not using a mixer) until a sticky dough forms. Form the dough into a ball. Put dough in a large oiled bowl and turn to coat. Cover bowl with plastic wrap and a kitchen towel and let dough rise in a draft-free place at warm room temperature until doubled, 2 to 2 1/2 hours. Punch down dough (do not knead), then halve. Cover one half with plastic wrap. Cut the other half of dough into 12 equal pieces. Roll each piece into a 12-inch-long rope with floured hands (flour surface only if dough is sticky). Make a loop with each rope, wrapping it around fingers of one hand, then knot dough twice through loop, leaving 1 end in center on top and tucking bottom end under. 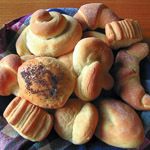 Transfer to a baking sheet, arranging rolls 2 inches apart. Repeat with the remaining dough, and place them on the second sheet. Cover rolls with a kitchen towel (not terry cloth) and let rise in a draft-free place at warm room temperature until doubled, 1 to 1-1/2 hours. Preheat the oven to 375° F/190° C with racks in upper and lower thirds. Prep Time includes multiple risings. Rolls are best the day they’re made but can be frozen for 1 month. Allow the rolls to cool completely, then wrap well in plastic. Thaw, then reheat on a baking sheet in a 350°F oven until warmed through, 5 to 10 minutes. Andrea, these look so good. You can’t possibly know how much I’d love to eat one of these right now. I bet they were delicious! Great job, as always! Ha! This is the one I chose first, too! And you’re so right on the flavor. I love the texture of the cracked wheat and the salt on the top. Toasted with a bit of honey is even more yummy! I haven’t seen my photos yet, but yours are terrific looking! I think I’m going to like this one day a week for a month deal. Very fun! Wow, you did a great job with those, they look excellent! Wow, those look amazing. I love whole grain breads, and the whole salty-pretzel thing has me drooling. Low carb, fo farb, I say! Hook us up with the eclair recipe from your header too, eh?! Hope all’s well. Oh, so nice, Andrea! I am going to have to try these (when I have some time to spare, lol). These looks wonderful. I am eyeing these. Thanks for the tip about the diffrence between Bulger and cracked wheat. I have this cute image of the boys stuffing themselves with rolls. THEY LITERALLY LOOK LIKE —–! Oh man, it would be even more hilarious if you mixed nuts in there. ha. Yeah – I’m not seeing the turds either…lol. Hmm, they look like cracked wheat knot rolls to me. These rolls were a lot of work and look delicious. Good job! 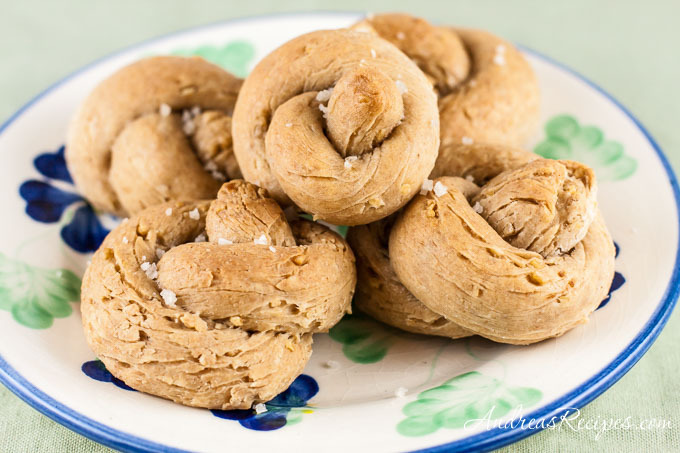 These cracked wheat knot rolls look awesome. These might be great for Easter dinner this year.